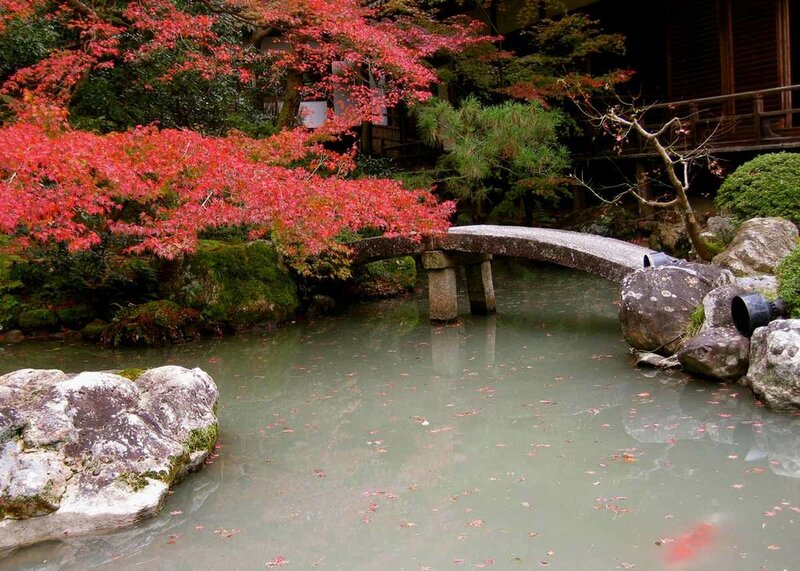 Japanese gardens are renowned for their transcendent beauty. The classical Zen garden, for example, is praised for its purity and meditative spirituality. Its transformative quality is by no means an accident; Japanese gardens are meticulously designed and carefully crafted down to every single element. Their distinct styles are in fact exceedingly varied and reveal a deep connection to Japan’s history and culture. Anika Ogusu is a passionate gardener with a special interest in Japanese gardens. She is also the founder of Real Japanese Gardens, which is the most comprehensive online source for everything to do with Japanese gardens. Definitely worth your time to check it out! Here is the low down on 5 of the most important types of traditional Japanese garden design and the elements that you will find in each. A little background to these styles will really enhance your understanding next time you visit a Japanese garden! The dry landscape garden (枯山水 Karesansui) is the best known type of Japanese garden type and is often called Zen garden. While monks do use them when practicing Zen, meditation more commonly takes place in groups in large rooms, often with no window. Dry landscape gardens lack one elements that ties together all other styles of Japanese garden: the water. Water is instead replaced by gravel, giving the impression of a dry ocean or river. While people tend to focus on the stone settings of a dry landscape garden, the skill of the person who creates such a garden is more accurately reflected by the empty space between the stone groups. It is called yohaku no bi – the beauty of empty space. Dry landscape gardens are famous for using only gravel and rocks, although in fact this is not quite true. In many dry gardens, plants play an important role. 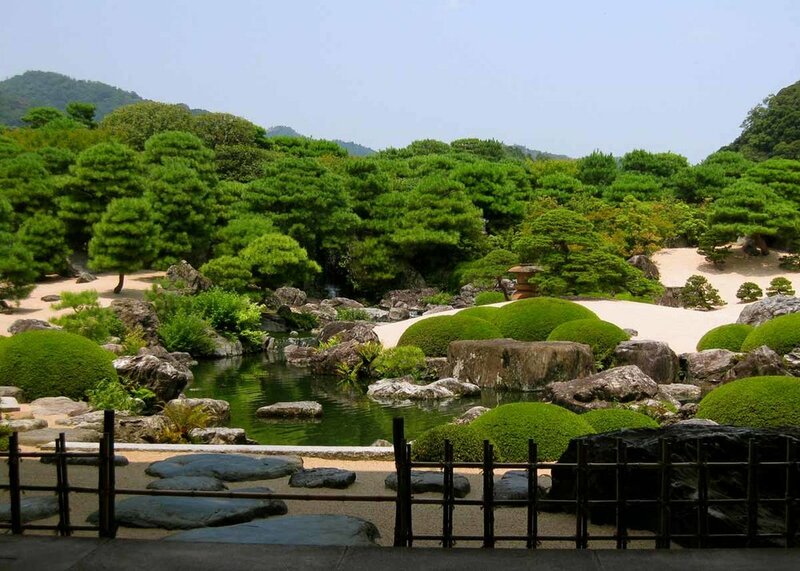 The first pure dry landscape gardens were built during the politically very turbulent Muromachi period (1336 - 1573). Since that time, some popular patterns and styles have developed for the layout out of the stones, known as Ishigumi (石組み). Sanzon-ishigumi, the stone triad, is perhaps the most popular stone setting in Japanese garden design, representing a deity-stone in the middle with two supporters on either. This arrangement is generally used in a religious context. 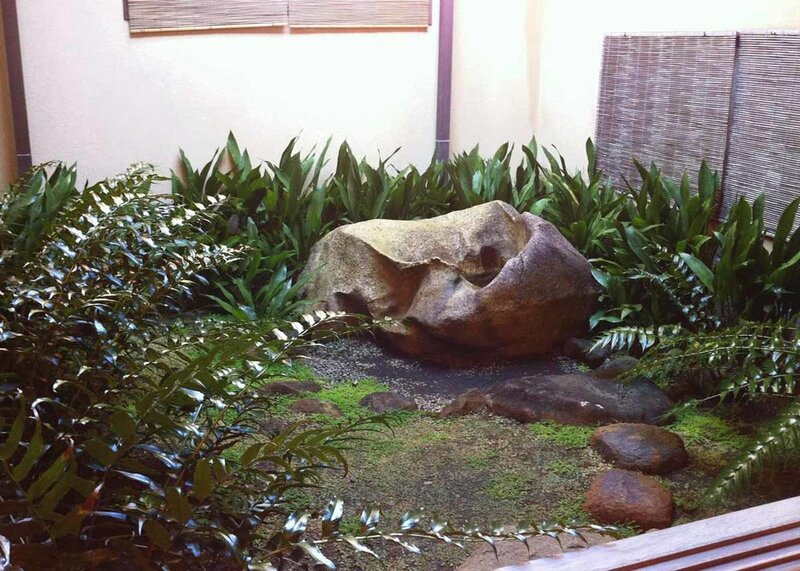 The Shichi-go-san (7-5-3) arrangement is another famous stone setting. 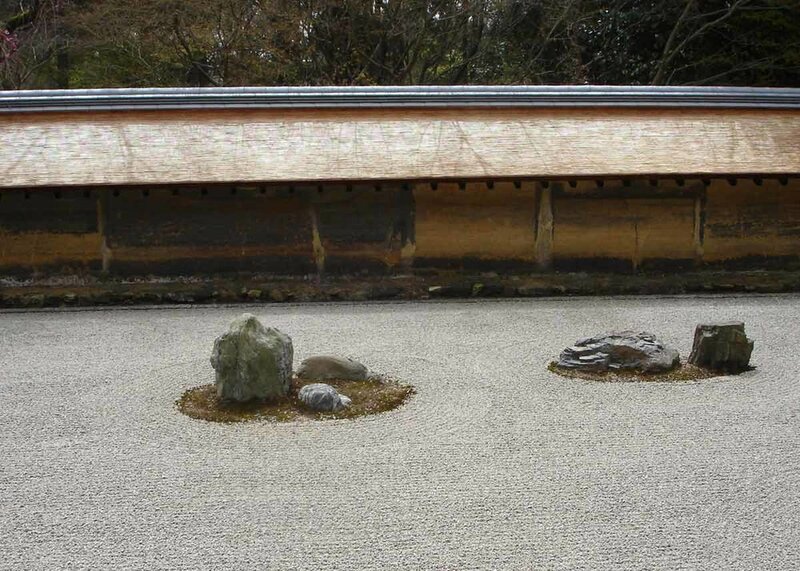 A good example is the dry landscape garden of Ryoan-ji in Kyoto. 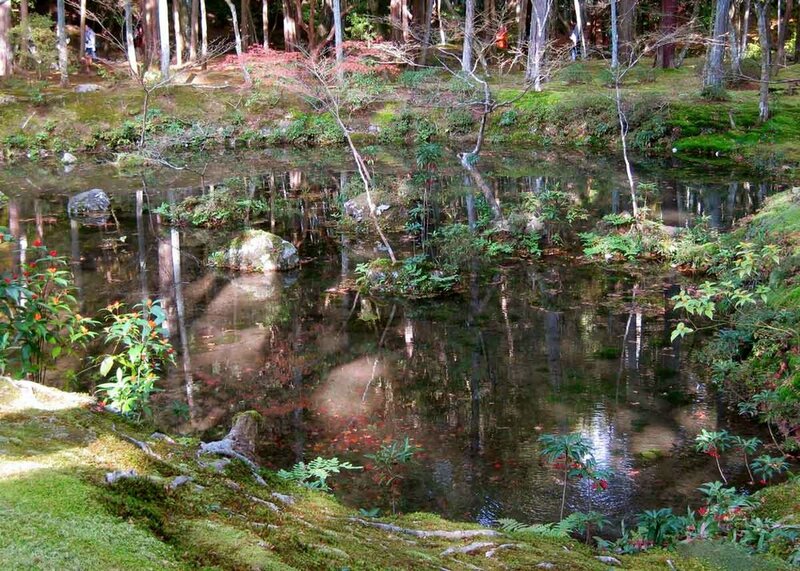 Yodomari stone arrangements are created by placing rocks in a line in a pond in front of an island. The stones represent ships anchoring there and waiting for treasures, which can be gathered on the island. You don’t have to be in Japan to visit some stunning traditional Japanese gardens. Check out these 12 Stunning Gardens in the US. This type of garden is one of the oldest in Japan, and is still common today. Unlike most other types, the study garden (書院造庭園Shoinzukuri Teien) isn’t designed for visitors to wander around, but rather to enjoy it from the study, like a painting. The most common layout for a Study garden begins with a pond nearest to the visitor, with the garden leading the view up an incline beyond. Bridges are often placed on one side of the pond while both stone settings and small shrubs are arranged in various locations on the garden slope. Some of the stonework you may see include lanterns, pagodas and statuary. Kasuga-style lanterns (灯籠 Toro) are the most common type and can be found in almost every traditional Japanese garden. The firebox is hexagonal with two openings and carvings of deer. These lanterns stand on a single solid pillar. Snow-viewing lanterns stand on three or four legs next to a pond. The big umbrella is perfect to catch the falling snow and present it as a soft white hat to the carefully watching eye. A famous lantern style, but not so frequently employed in Japanese garden design, is the Rankei lantern. The firebox is placed on an overhanging pillar and placed over a pond or stream. Pagodas (石塔 Sekito) became a more popular design element from the Edo period. They are normally placed on a hill, half covered by shrubs and standing under trees, to recreate the sense of the pagodas constructed throughout the mountains of Kyoto. In the west, statues of Buddha are sometime used as decoration. In Japan however stone Buddha statues (石仏 Sekibutsu) would only be used in gardens connected to a museum or a temple. Sometimes Buddhist deities are displayed on stone plates in a hidden corner of a strolling garden. Most strolling gardens (回遊式庭園 Kayushiki Teien) were constructed during the Edo period (1603 – 1868) by daimyo (feudal lords) and are therefore sometimes known as daimyo gardens. The gardens of the Edo period reflected the peace in the country: very soft shorelines, un-dramatic stone settings, and softly curved hills. These types of Japanese gardens often recreate scenes from history and myth, both from within Japan, but also from China. The design of these daimyo gardens reflected the wealth and intellectual prowess of the garden’s owner. As these gardens were nearly always arranged around a central pond, or lake for the very well-to-do, bridges were an essential element of the design. Curved bridges were commonly used in Heian period palace gardens about a thousand years ago, where boat parties would be held on the ponds. The bridges needed to be curved, so that boats were able to pass underneath them. Today these curves are no longer necessary, but survive as a popular decorative motif. Stone bridges come in various shapes: slightly curved, as one whole block or as two blocks parallel to each other with only a small overlap in the middle. Stone bridges are made of hewn rock and are used to span shorter distances. Despite some rumors, zigzag bridges are not constructed to prevent demons from crossing. In fact zigzag bridges have their origin in a compilation of poems about a man crossing the eight branches of a iris-strewn river. For this reason zigzag bridges are commonly used in gardens where many irises grown. Larger zigzag bridges also enable the visitor to take different perspectives from which to view the garden. One great strolling garden that was certainly not commissioned by a Daimyo is the Portland Japanese Garden in Portland, Oregon. You can find out all about it in our Complete Guide. Japanese tea gardens (茶庭 Chaniwa or 露地 Roji) are always connected to a tearoom or tea house and are an integral part of the tea ceremony. The garden is an important instrument for the guests’ mental preparation. Walking from the entrance of the garden towards the tea room, guests purify themselves through various rituals in order to achieve the right mindset for the coming ceremony. A typical tea garden has one or more gates, waiting shelters, a toilet, stepping stones, a water basin (tsukubai), a waste hole and mostly evergreen, non-flowering plants. 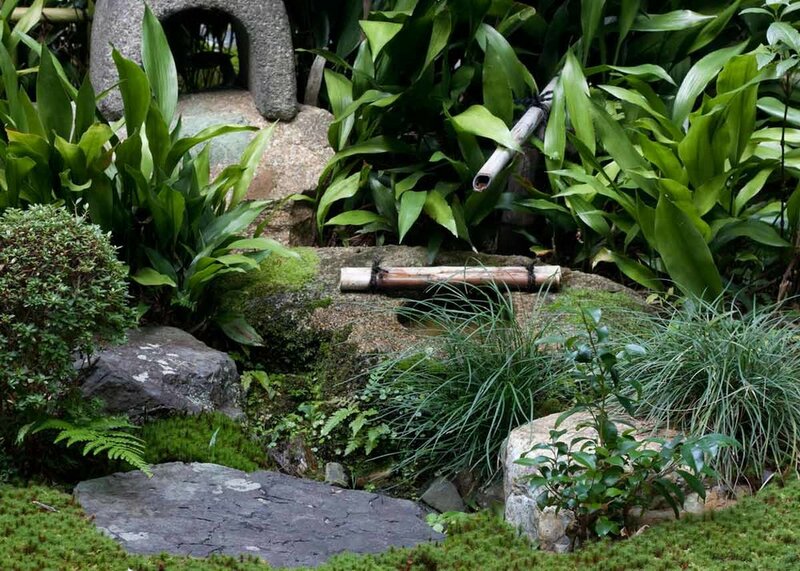 Japanese garden designs relies on a variety of different trees and shrubs, but one particular distinguishing feature is the extensive use of moss. The mostly commonly seen trees are the black pine, red pine, and the Japanese maple. Other evergreen shrubs, which can be found in almost every Japanese garden are the Camellia, Podocarpus macrophyllus, Japanese pieris, Mahonia japonica and the Satsuki-Azalea. Several varieties of mosses are cultivated with the most common type being the sugi-goke, a Polytrichum variety. Lately, Racomitrium canescens is becoming more and more popular. Gardens within the walls of a residence or in a small, enclosed space beside them, are known as Courtyard Gardens or Tsuboniwa (坪庭). This type of Japanese garden first appeared during the Heian era (794 – 1192). During these times women were often given a name that referred to a specific plant which grew in the tsuboniwa next to her quarter. As houses grew bigger courtyard gardens also took on the function of regulating the temperature and airflow in the home during the long hot summers. Various water features were particularly effective for this, and are used in many types of Japanese garden. A tsukubai is a hand washing basin composed of several elements that is commonly used in Japanese tea gardens. There is a basin in the middle with two stones on either side. A stepping stone path usually leads towards a large flat stone in front of the basin on which to stand. Water flows into the basin through a bamboo tube, and a lantern at the back of the basin helps to guide the guest towards it. The Suikinkutsu is a popular, almost musical, feature of a garden. A jar is buried upside-down in the ground and covered with cobblestones. As water drips through a hole in the bottom of the jar and hits the standing water in its top, it makes a sound like a harp. The shishiodoshi is sometimes known abroad as a deer-scarer. A bamboo pipe is balanced like a seesaw under a source of flowing water. One end of the bamboo pipe is open and one is closed. When the open end fills with water, the extra weight causes it to snap down. It makes a very pleasant soft crack as it tips back into place. Japanese gardens feature a large variety of unique elements and styles. Which are your favorite? Let us know in the comments below. And don’t forget to check out Real Japanese Gardens where you can find downloadable ebooks on all aspects of Japanese garden design.